If you’re like me and need a little help getting through your Mondays, I’ve got a happy fix right here! 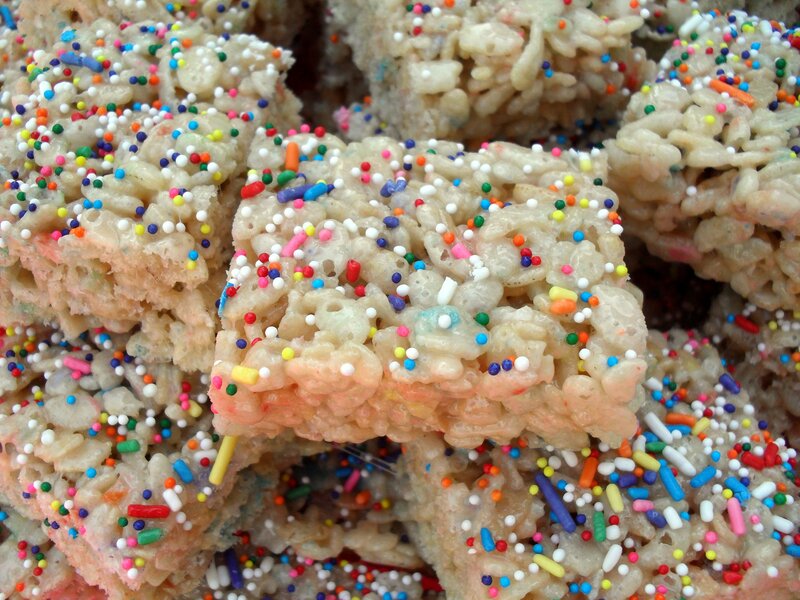 I’m a fan of crispy treats, especially those that are a little different, like my favorite Salted Brown Butter Crispy Treats and Gingerbread Crispy Treats, and now I have a third unique and fun recipe to add to my growing list of favorites. 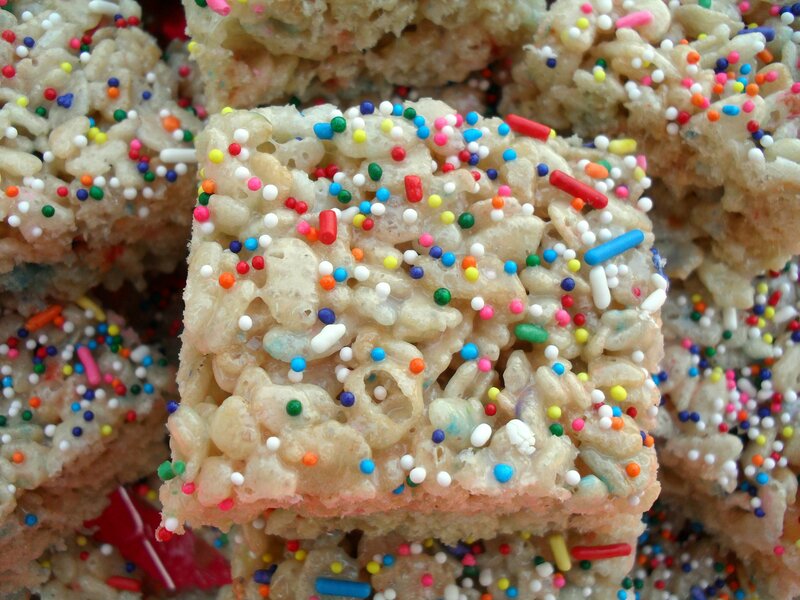 Cake batter flavored crispy treats! Come on, get up, throw your hands in the air, squeal a little “Yay!” and do a happy dance for technicolor sprinkles. OK, now your Monday is already off to a better start! Melt butter in a large saucepan over medium heat and add marshmallows. Stir until they begin to melt, then add cake mix and stir until combined and marshmallows are completely melted. Stir in cereal until it is completely coated with marshmallow mixture. Add half of the sprinkles and mix. 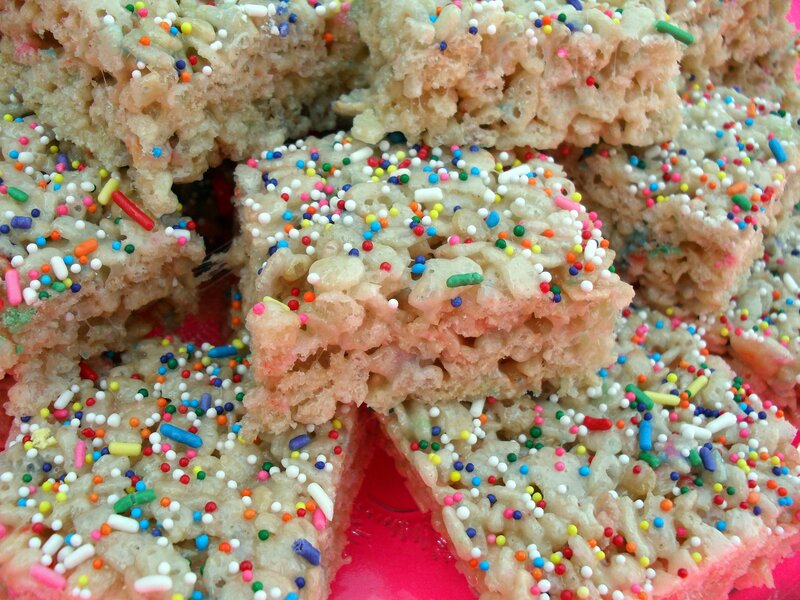 Press into a 8 or 9” square baking dish and top with remaining sprinkles. Let sit for at least 30 minutes before cutting. So if you’re like me, you’re wondering what to do with the nearly full bag of cake mix that will remain after making this recipe. Don’t fret, there are plenty of things that you can easily add it to for more delicious cake batter flavor. So far I have made cake batter oatmeal (I subbed wheat bran for oat bran and more cake mix for the vanilla protein powder but did everything else the same and felt I was eating a fairly nutritious, not to mention delicious, breakfast), cake batter candy (stirred some mix into leftover white candy coating from a batch of cupcake bites and poured the chocolate into candy cups molds, then topped with sprinkles–tasted fantastic! ), and here are a few more ways to use up your extra mix: Cake Batter Pancakes, Cake Batter Cinnamon Rolls, or how about mixing some into a vanilla milkshake to magically turn it into a sprinkle-licious cake batter milkshake? The possibilites are endless! Wheeeee! 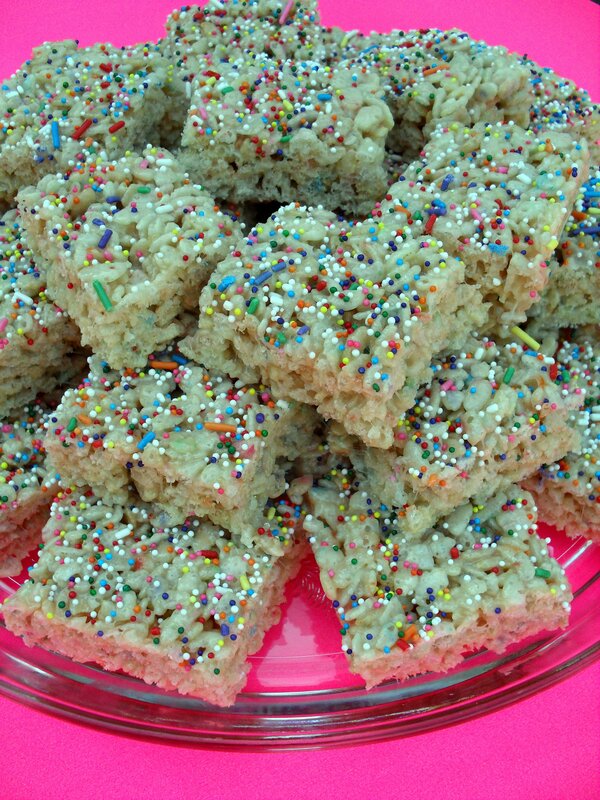 Posted in Brownies & Bars and tagged birthday, cake batter flavor, children, crispy treats, fun, kids, party, recipe, rice krispies treats, sprinkles, treats. Bookmark the permalink. I saw these on Dana’s site and I think that I will be making these for a kids BBQ coming up in a few weeks!! And I’m so glad you shared the recipe! It’s wonderful–thank you! These do totally look like a party. Yay for technicolor sprinkles! they look like a serious monday fix up! Will have to try that next week! They look so delicious! Anything with sprinkles on it can’t help but make me happy! I’ll let you know what I think when I’m done. Thanks! I knew that someone would fall prey to the appeal of the sprinkles….even if you aren’t using them in yours! :D I think you’ll like them–let me know what you think! Um, that is definitely insulin worthy Veronica!! Yum! These look so yummy! My best friend and I always like to eat birthday cake ice cream together when we hang out, but we may have change it up a little next time and make these! Aww, they’re so cute! I think I may have to make these for the next family get together! Your cake batter candy sounds wonderful! “Come on, get up, throw your hands in the air, squeal a little “Yay!” and do a happy dance for technicolor sprinkles.” <- STILL laughing at this! Love the excitement! I LOVE Cake Batter goodies! Haven’t tried these yet though- they’re on the list to be made tomorrow! :) I’m drooling over your pictures in the meantime!